Don't you just hate it when you get dressed, your adrenaline is pumping, you hit go and your potential client is a no show? In this episode I am going to share two tips a new twist, and a recommendation to help avid discovery call no show. First, make sure your scheduling software has your timezone confirmed. Second, make sure that you've got automations in place so your potential client gets a reminder with a link, time, and date. But here's the thing, that strategy that you've been using, having your scheduling link out there and passing it out like candy is root of the problem. So what can you do? I want you to flip your current strategy on its head and protect your scheduling link. 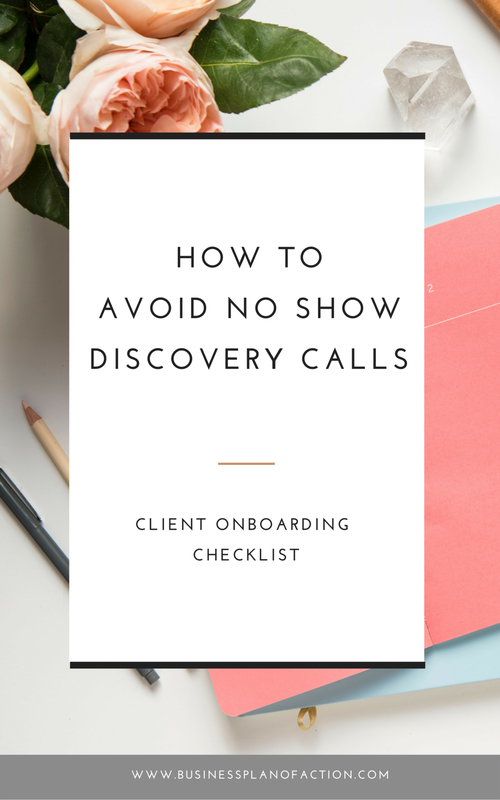 The solution to no show discovery calls is that your potential client needs to have some skin in the game. What do I mean? They need to have some commitment in the process. You have heard me say it before but sharing your scheduling link with every potential client does nothing to distinguish you or your business. My strategy for weeding out your no show discovery calls? Share an initial client intake form. Let's take a look at some of the benefits of sharing a client intake form. 3. (THIS IS THE BIG ONE!) You are weeding out the people who are not serious about hiring you. Your time is valuable! So what should you include in the form? I recommend name, email, business website, preferred social platform, maybe a little bit more information about their business, budget, and start date for the project. By sending out this initial intake form, you have at least an initial commitment. Think about it, they've actually taken time to fill out your form so they have passed the first step in talking to you. To send out your scheduling link because that is what all the other service providers are doing is going to have you spinning your wheels. I am all about maximizing your time because it is your most valuable asset. I want you to be in front of clients that are serious about you and the services that you have to offer. Here's a bonus. I'm going to recommend that you designate one day a week and a specified timeframe that you're actually going to be sitting down to do your discovery calls. Your discovery calls are sales calls and you need to be in the proper mindset, not buzzing in from the grocery store or putting the kids in front of the TV with candy, dogs outside and threatening everyone that breaths in your house to be quite while you hop on a call. I understand that this designated time feels uncomfortable, scary, and you feel like you are missing out. Trust me, I used to be scared that people wouldn't show up. You are not all call every day at any time to talk to someone who is not even paying you at this point! And the only thing you are missing out on is a potential no show. You have everything to gain and distinguish your business from everyone else's out there! Not to mention the potential client's mindset when they do get your scheduling link, "Wow, this is all the time she has - she must be booked up." I go into a lot more detail about this particular strategy as well as how to avoid the biggest discovery call in my new masterclass, Discovery Call Gold. All you have to do to register is to click on the link below and you will get some actionable strategies that you can implement in your business today. If you're tired of doing the same thing and getting the same results, I invite you to come to the masterclass it will be impactful to you and your business.